Riviera residents celebrated the 90th birthday of our beautiful community with a ribbon cutting for two new historical markers. Created by the Friends of the Hollywood Riviera, the signage identifies our community at the corner of Palos Verdes Boulevard and Via Monte D’Oro, which was the original entrance to the Hollywood Riviera. The marker stands at about 6′ x 5′. Both markers use a font on the front that is a close replica of the one used in original promotional materials for the neighborhood. The rear of the marker is set with custom period tiles and reads: “The Hollywood Riviera was established by developer Clifford F. Reid in 1928. Inspired by the beauty of its seaside location and surrounding hills, he coined the name due to his familiarity with the French Riviera and to attract residents from the movie industry. Sales initially boomed but were soon constrained, first by the Great Depression in 1929 and later by World War II. By 1941, only 42 Mediterranean style, red-tile roof homes and one apartment house had been built. Ultimately, it was the aerospace industry rather than Hollywood that contributed to the neighborhood’s growth. (where the Beach Club was situated before it burned down). The group is also working on documenting the history in written form to preserve it for current and future generations. The history project is being undertaken by the Old Hollywood Riviera Research Group. 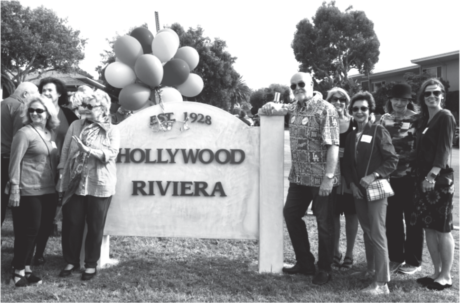 To learn more about the Friends of the Hollywood Riviera, including how you can support their efforts, please visit friendsoftheholywoodriviera.org or contact klent1472@earthlink.net. 0 Responses on "Hollywood Riviera Celebrates New Community Markers"